Sgt. 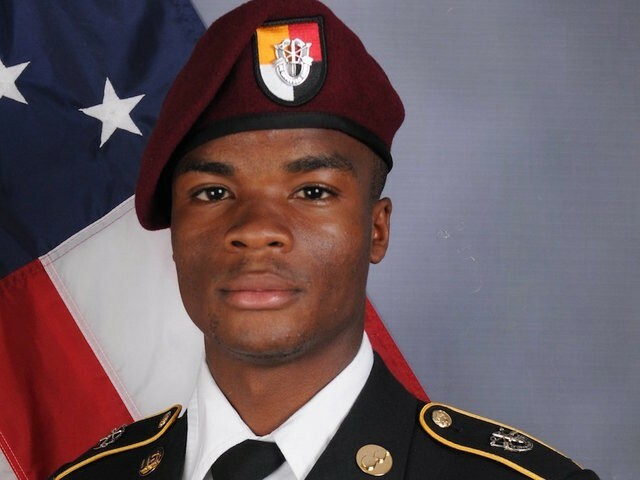 La David T. Johnson was killed early this month in Niger. WASHINGTON — The widow of one of four soldiers killed in Niger went on television Monday to criticize President Donald Trump for how he spoke to her during a condolence call last week, saying the president blundered through the conversation and only deepened her grief because he did not seem to know her husband’s name. Myeshia Johnson, the widow of Sgt. La David T. Johnson, who was killed early this month, spoke in an interview with ABC News’ George Stephanopoulos and also offered words of support for Rep. Frederica S. Wilson, D-Fla., who has been feuding with both Trump and John Kelly, the White House chief of staff, over the call. “The president said, ‘He knew what he signed up for,'” Johnson said during the interview. “But, it hurts anyway. It made me cry because I was angry at the tone in his voice and how he said it.” She added that Trump’s memory seemed to falter during their exchange. After the interview aired, Trump wrote on Twitter that he had a “respectful conversation” with Johnson, disagreeing that he stumbled over La David Johnson’s name. Myeshia Johnson said Monday that she let Trump do most of the talking as her anger grew during the call. When asked if she wanted to say anything to Trump, the young widow decided against delivering a message. She did, however, say that she was desperate to know more details about the disappearance and death of her husband, and described him as “caring” and a “great soldier.” The couple had known each other since she was 6 years old. “I want to know why it took them 48 hours to find my husband,” Johnson said.